How the pound, the Mayor’s Alliance, the ASPCA, and Maddie’s Fund conspire to hide the truth about New York City’s abusive pound system, allowing immense animal suffering to continue. 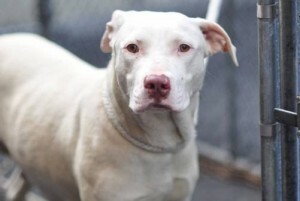 In late March, a pregnant lab-mix given the name of Ginger entered the New York City pound system. She was full term, within a day or so of giving birth. Spaying a dog in the peak of health is considered major abdominal surgery. Spaying a pregnant dog increases the risk as the blood vessels of her reproductive tract become large and more difficult to tie off during pregnancy. Spaying a pregnant dog at full-term is the riskiest of all: the risk of excessive bleeding is greatest and complications more likely. And, of course, spaying a pregnant dog means killing the puppies. Nonetheless, Ginger was spayed, and her fully viable litter of puppies was killed. In order to kill them, each and every one of the healthy puppies had to be individually injected with poison. The killing of the puppies was, in point and fact, no different than if they had already been born since they had been born: by the equivalent of a C-section. They were able to survive on their own and, in fact, did survive, but not for long. One by one, they were injected in the stomach with an overdose of barbiturates. One by one, they went limp and then died. One by one, their lifeless bodies were discarded in the trash, revealing the great hypocrisy of the broken pound system in the U.S., a system which chastises people for treating their companion animals as “disposable” even while they treat them exactly the same way: by killing them and then literally disposing of their bodies in landfills. The new lives of Ginger’s puppies, which should have held nothing but promise, instead were wiped out by callous indifference. It was a tragedy, but it should have surprised no one. 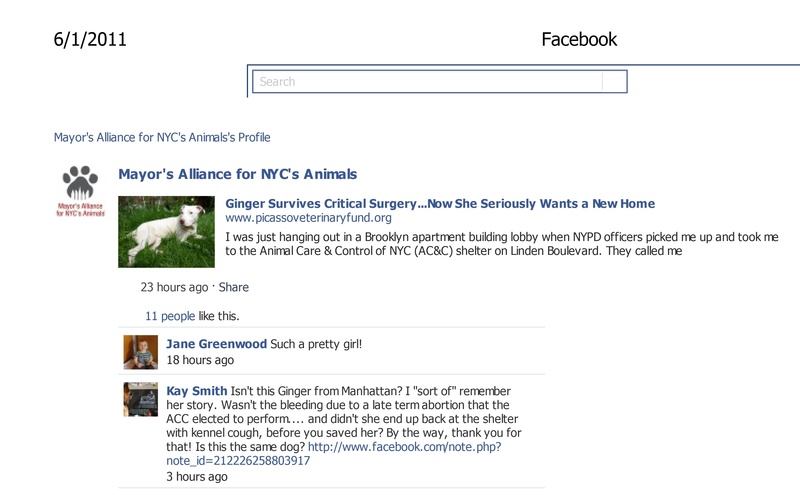 The New York City pound is run by Julie Bank whose tenure there has been marked by the firing of anyone who disclose inhumane conditions, the violation of the first Amendment and civil rights of volunteers, the scaling back and elimination of programs designed to save animals, and the creation of a culture that tolerates chronic neglect and abuse. That, too, should have surprised no one. Because, in fact, this was also how she ran the “shelter” at her previous job. Bank was part of the executive team under Ed Boks which ran Maricopa County, AZ animal control into the ground. (Boks was also Bank’s predecessor at New York City’s pound before he was fired.) Bank’s job was to “sell” Boks’ failures as success, by lying to supporters, to elected officials, and to the media that the agency was a model of compassionate care, even as she and Boks knew full well that the agency was in trouble. Under her tenure, the Maricopa pound slaughtered tens of thousands of animals a year, opened up a $600,000 a year structural deficit, and forced the agency into receivership. Volunteers were forced to walk dogs with ropes because the agency was not allowed to buy leashes, even while Bank was telling anyone who would listen that they were the most progressive adoption agency in the nation and on the verge of achieving No Kill (they never did better than a 50% save rate, less than the national average). She abandoned ship while the agency was sinking under the twin pillars of Boks-Bank ineptitude and neglect. Given her history and the conditions in the pound she currently oversees, why would she ever give so much as a second’s thought to Ginger’s puppies? In fact, she wouldn’t and didn’t and that is why she ordered them killed. 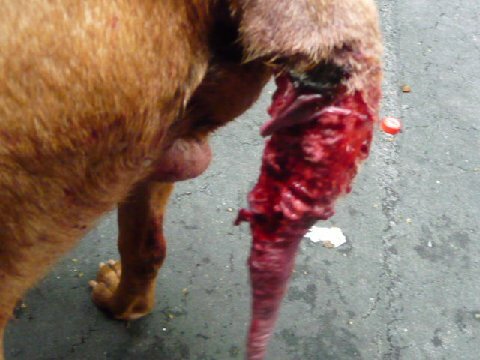 After the surgery, Ginger began to bleed internally, a fact that AC&C noticed almost too late. 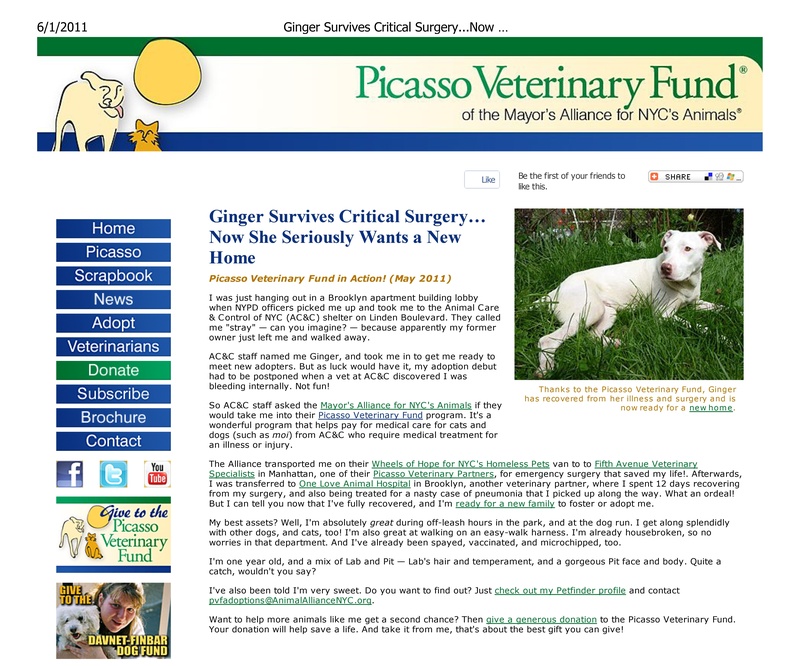 Ginger underwent a second surgery at a private veterinary clinic to save her. 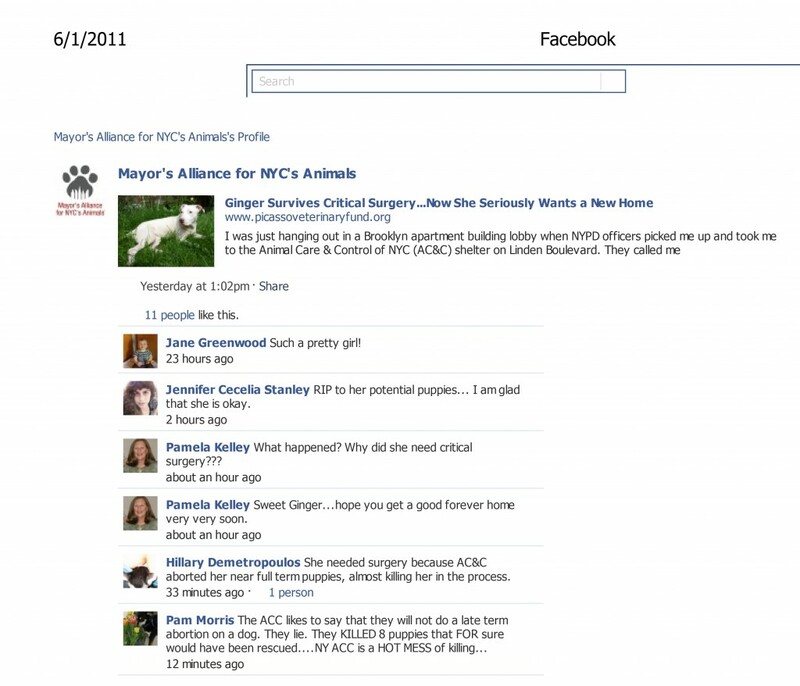 That surgery was paid for through donations made to the Mayor’s Alliance for NYC Animals. In turn, Jane Hoffman who runs (owns?) the Mayor’s Alliance put out a fundraising appeal based on Ginger’s case. AC&C staff named me Ginger, and took me in to get me ready to meet new adopters. But as luck would have it, my adoption debut had to be postponed when a vet at AC&C discovered I was bleeding internally. AC&C decided to perform an unnecessary surgery in order to kill my puppies. I never got to love them, never got to nurse them, never had a chance to lick their tiny bodies, to take in their warm breath which smells of bubble gum. I never even got to see them because someone cut me open, took them out, and then poisoned each and every one of them before throwing their bodies in the trash.They didn’t even give them names. In fact, no record of them exists. Following the surgery, I began to bleed internally. Thankfully, AC&C did not do the surgery. They sent me out to a private veterinarian who saved me. Of course, that cost money, which you are now being asked to pay even though I wouldn’t have needed the surgery if AC&C didn’t botch the first one in order to kill my puppies. Why did Hoffman delete those posts which tell the truth about what happened to Ginger? Because telling the truth exposes it. In exposing it, Hoffman would have been required to respond appropriately. And in defense of the tragic and needless neglect, abuse, and killing within the NYC pound, that she has proven herself unwilling to do. These are the kinds of practices that are illegal under state anti-cruelty laws and would lead to prosecution if it was done by anyone other than staff at the pound. Rather than seek jail sentences for these abusers, Hoffman seeks to protect them. And anyone who questions it, who tries to reform it, who works to protect the animals, is banned. Those who volunteered their time to save animals—who were, in fact, successful at it—have been fired. Meanwhile, Jane Hoffman continues to proclaim to anyone who will listen that the City is on pace to become a No Kill community, a claim she had made twice before (promising one as far back as 2008), both times failing to deliver. In fact, killing Ginger’s puppies violated the terms of the Maddie’s Fund grant for New York City. In order to continue receiving funding, New York City is not allowed to kill any healthy dogs and cats. Despite the fact that AC&C staff has admitted doing so, as long as the pound reports no healthy deaths, the Mayor’s Alliance is content to go along with the charade. Banks did not give Ginger’s puppies a record number, did not count them in statistics, did not report their lives or their deaths. They simply never existed. 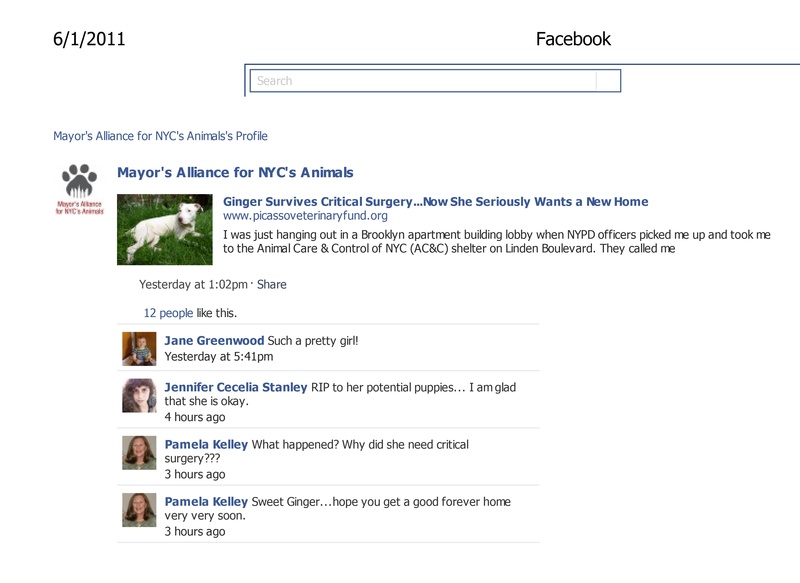 That way, Jane Hoffman can continue to tell Maddie’s Fund that no healthy dogs have been killed, and Maddie’s Fund can continue to tell all of us that New York City is a model of compassionate care. Bank looks the other way, Hoffman looks the other way, Maddie’s Fund looks the other way. See no evil, hear no evil, speak no evil. And those in the greatest position of power to actually do something about it, refuse to even acknowledge its existence. Maddie’s Fund is financing the person that worked to (successfully) kill a law that would have empowered [rescuers], would have saved the lives of tens of thousands of animals, and given that they bankroll her, it was within their power to make her stop. But they didn’t. More than that, they continue to shield her from any criticism and accuse those who do of “bash and trash.” They even champion the New York City shelter system that is rife with neglect and cruelty, a system which violates the constitutional rights of volunteers by threatening to fire them if they try to help the animals by exposing inhumane conditions to the public, as a national model, protecting and legitimizing that which causes harm. Last year, I reached out to Maddie’s Fund and asked Richard Avanzino to use the leverage of his funding of Hoffman’s group to insist she drop all opposition to a badly needed law that would have saved the lives of 25,000 animals a year. I did not suggest Maddie’s Fund walk away from the animals of New York City. There are others who can take the lead for a No Kill NYC, groups that would not use the position that Maddie’s Fund funding gives them to also fight progressive No Kill reforms, costing so many animals their lives. So desperate for some success given that they have spent $100 million and utterly failed to create a single No Kill community despite promises of a No Kill nation by now, Maddie’s Fund refused; willing to take the lie of success over actually achieving it. They not only increased Hoffman’s funding by an additional $3,000,000, they accused those of us who stood up to her of “bash and trash,” even as she worked to condemn 25,000 New York State animals to death. They called New York City a national model even in the face of rampant neglect and cruelty occurring there. They claimed they were saving all healthy dogs and cats in the face of outright lies by the pound and Mayor’s Alliance about progress within the city. That defense of killing and of someone who champions killing, who fights legislation to ensure that the paradigm of killing is not upended, is why I wrote “Losing My Religion” and why I walked away from them. Adding insult to injury, Jane Hoffman was a featured speaker at the day-long Maddie’s Fund workshop at HSUS Expo in 2010, where she told the assembled crowd as a representative of Maddie’s Fund that they should not be made to feel guilty about killing healthy animals. In defense of Hoffman, Maddie’s Fund says that since they began funding New York City, 20,353 less animals are being killed within the city pound system. Of course, many of these animals would have been saved by the rescue groups Hoffman wants to keep disempowered and claims are “hoarders” and “dog fighters” in disguise anyway, as even Avanzino himself admits. And communities have achieved far greater success in reducing killing, have done it faster, and have achieved No Kill without Maddie’s funding. Case in point: Washoe County shelters take in seven times the per capita rate of animals as New York City “shelters” do, but saved 91% of all the animals. But irrespective of that, even taking the claims at face value, roughly 25,000 animals are being killed every year throughout New York State because shelters are turning away rescue groups willing to save those animals. A law which would have prevented this outcome was defeated by Hoffman, who Maddie’s Fund keeps in power through their funding. At the end of the day, Maddie’s funding of Hoffman means 4,647 more animals are losing their lives every year in New York State than are being saved thanks to Hoffman’s desire to maintain power and control. And she isn’t the only one doing so at the expense of the animals. Every year, the ASPCA takes in well over $100,000,000, promising to help care for the homeless animals in the city, promising donors that when animals need help, the ASPCA is there. It too fought the law to save 25,000 of them in New York State, a law that was in fact sparked by the ASPCA’s callous killing of an abused dog despite offers to save her from rescue groups. And while Ed Sayres of the ASPCA also defends the city pound, champions it as a national model, and while he continues to hoard the ASPCA’s millions, the animals who are unfortunate enough to enter the city’s pound go without basic care, suffering neglect and abuse in the process—just down the street from the nation’s wealthiest SPCA and one of the richest charities overall. Just down the street from the agency that raises $30,000,000 a year from a single Sarah McLachlan commercial which promises to use those donations to protect animals from the type of neglect and harm they must endure at the NYC pound, where the ASPCA itself sends animals it does not want to spend money on. There is no doubt that the Mayor of New York City is a callous, hard-hearted individual when it comes to the homeless animals of that city. There is no doubt that the Department of Health which oversees the pound is staffed by uncaring, mean-spirited bureaucrats who have no business with power over defenseless animals. And there is equally no doubt that Julie Bank is cut from the same cloth. But when it comes to money, New York City’s animals should never go without. New Yorkers have proven themselves to be extremely generous, overflowing the already bloated coffers of the ASPCA. Despite those hundreds of millions of dollars in revenues every year, the ASPCA claims it is doing all it can. In other words, it could not save Ginger’s puppies. The Mayor’s Alliance could not. The pound could not. None of the other millionaire organizations fundraising on the backs of New York City’s homeless animals could either. But rescue groups, despite shoe-string budgets, could and would have, had they not been callously prevented from doing so by those in positions of power. Listen to 77WABC in New York City on Sunday, June 5, at 6 am ET for a 1 hour expose on the cruel cages of New York City’s abusive pound.